My to-do list is at the center of my personal workflow. Like you, I am bombarded with scores—sometimes hundreds—of requests every day. They show up in my inbox, on the phone, and at my door. All of them want action now. That’s why years ago, I learned the importance of creating a daily to-do list. It might sound simple, but I don’t know of a more important productivity tool. Make sure your to-do list consists of “next actions.” This is the secret to getting things done and avoiding procrastination. You have to break a project down into discrete actions. For example, “Prepare Thomas Nelson Strategic Plan” is a project. “Write first draft of updated vision statement” is a discrete action within that project. I try to create a bite-sized action that I can complete in a less than a few hours. If it’s going to take more than that, I break the action down further. Prepare your to-do page the night before. I like to do this toward the very end of the day. This gives my subconscious a chance to work on the items overnight. I find that I am much more productive the next day if I do this. It also gives me a chance to hit the ground running, knowing exactly what needs to be accomplished. Review your to-do list first thing in the morning. Before I do anything else, I review my calendar and my to-do page. The calendar provides the “hard edges” of my non-discretionary time. These are the things I must do. My to-do list provides the discretionary items I will have to get done when I am not in a meeting or otherwise committed. Reviewing these items first, provides me with the opportunity to make last minute adjustments to my game plan. I also arrange these items in roughly the order I plan to do them. Stay focused on your to-do page throughout the day. I always have my to-do list in front of me. 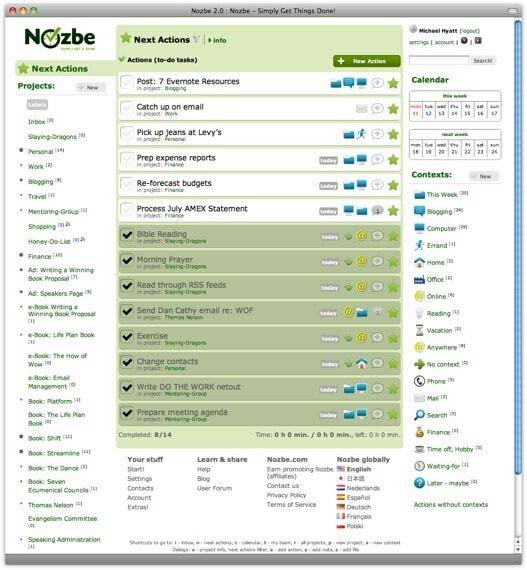 I use Nozbe, a software program for the Mac, so it is only a keystroke a way (⇧⌥⌘-T). But the tool is really unimportant. There are tons of great ones on the market, including Things (another favorite) or even a plain old Ecosystem Notebook. The main thing is to stay focused on one project at a time, check it off, and then go to the next one. When you’re to-do page is your command center, it keeps you from getting distracted by everything else pinging your brain. Add to your to-do list as items occur. You want to be able to get to-dos out of your head and into a reliable system for follow-up at the appropriate time. If they keep rattling around in your head they “consume psychic energy,” as David Allen puts it. Again, I try to keep this a two-keystrokes away. With Nozbe, I just press Ctrl-Alt-Command-T, and it opens a new to-do window. This is fast and effortless. Rinse and repeat. I rarely get everything on my daily to-do list done. Items that I don’t complete become candidates for tomorrow’s page. Sometimes, that makes them more important for tomorrow’s list or I realize that they items is no longer a priority and delete it altogether. Regardless, at the end of the day, I start the cycle over and prepare for tomorrow. If you don’t have a to-do list for yourself, you can bet others do. In my experience, the only way to stay focused on what is important, as distinct from what is merely urgent, is to have a to-do page in front of me and work systematically through it. Questions: What system do you use? How is it working for you? What do you wish it would do that it doesn’t?